In the context of Bosnia Herzegovina (BIH), this study explores the role of memory and culture of remembrance using art. More specifically it considers the example of a photographic exhibition, showing in various sites, called ‘War of Memories’ and curated by the Centre for Non-Violent Action. The aim of this paper is to provide insights, by investigating how the exhibition was de-signed and its connection with peace-building and reconciliation. With new political and economic developments in BiH, the question addressed is how post-conflict reconciliation can be promoted – or not – through the use of the creative arts, in this case photographic images of places of suf-fering (marked and unmarked). To gather data on the topic, eight semi-structured interviews were conducted with members of three groups: members of the Centre for Non-Violent Action, com-munity members and local organisers involved in peace activities and politics. Overall the finding was that the exhibition’s contribution to peace-building is present but with limitations, possibly because audiences tend to be those already in favour of reconciliation, rather than those opposed to it. This finding is of potentially great importance, since building peace-building and reconciling BiH society – or any other post-conflict setting - is vital for a transformation from ‘negative’ to ‘positive’ peace. The dilemma remains of how to expand the potential reach of such arts projects for peace, across all sectors of the community. 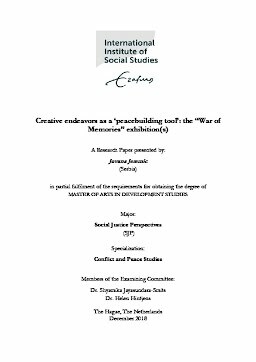 In a modest way, I believe that this study contributes to the wider field of peacebuilding, and focuses on the, admittedly limited, ability of the creative arts to challenge complex political and social attitudes that contribute to ‘ethnic’ conflict.